Fatu Kekula has cared for four of her family members with Ebola, keeping three alive without infecting herself. For more from Elizabeth Cohen on the ground in West Africa, watch CNN Saturday at 3 p.m. ET. 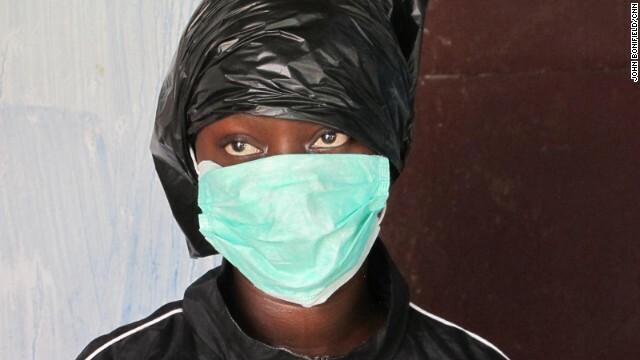 (CNN) — It can be exhausting nursing a child through a nasty bout with the flu, so imagine how 22-year-old Fatu Kekula felt nursing her entire family through Ebola. Her father. Her mother. Her sister. Her cousin. Fatu took care of them all, single-handedly feeding them, cleaning them and giving them medications. Fatu stayed healthy, which is noteworthy considering that more than 300 health care workers have become infected with Ebola, and she didn’t even have personal protection equipment — those white space suits and goggles used in Ebola treatment units. 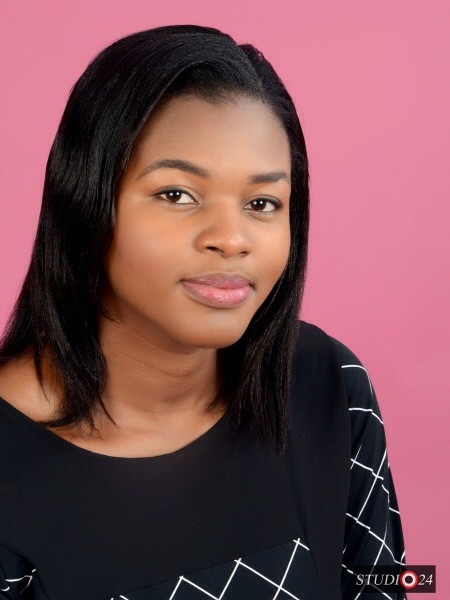 Instead Fatu, who’s in her final year of nursing school, invented her own equipment. International aid workers heard about Fatu’s “trash bag method” and are now teaching it to other West Africans who can’t get into hospitals and don’t have protective gear of their own. It was an arduous and time-consuming process, but Fatu was religious about it, never cutting corners. UNICEF Spokeswoman Sarah Crowe said Fatu is amazing. She emphasized, of course, that it would be better for patients to be in real hospitals with doctors and nurses in protective gear — it’s just that those things aren’t available to many West Africans. No one knows that better than Fatu. Her Ebola nightmare started Juy 27, when her father, Moses, had a spike in blood pressure. She took him to a hospital in their home city of Kakata. Fatu took her father to Monrovia, the capital city, about a 90-minute drive via difficult roads. Three hospitals turned him away because they were full. She took him back to another hospital in Kakata. They said he had typhoid fever and did little for him, so Fatu took him home, where he infected three other family members: Fatu’s mother, Victoria, 57; Fatu’s sister, Vivian, 28, and their 14-year-old cousin who was living with them, Alfred Winnie. While operating her one-woman Ebola hospital for two weeks, Fatu consulted with their family doctor, who would talk to her on the phone, but wouldn’t come to the house. She gave them medicines she obtained from the local clinic and fluids through intravenous lines that she started. At times, her patients’ blood pressure plummeted so low she feared they would die. Now he’s working to find a scholarship for Fatu so she can finish her final year of nursing school. He has no doubt his daughter will go on to save many more people during her life. “I’m sure she’ll be a great giant of Liberia,” he said. Editor’s note: CNN senior medical correspondent Elizabeth Cohen is in Liberia to report on the largest Ebola outbreak on record. 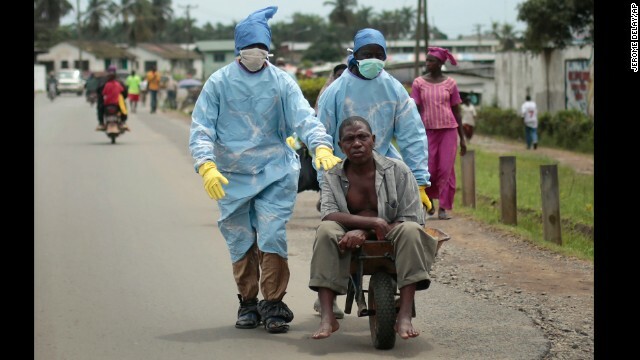 Monrovia, Liberia (CNN) — On the day the new Ebola clinic in Liberia opened, ambulances waited outside. Inside the ambulances were desperately ill patients who had come for treatment but instead would be left to lie on the ground as others walked by. The Island Clinic and its 120 Ebola treatment beds opened to fanfare Sunday afternoon, with a ceremony attended by international health officials and Liberian leaders. But the clinic, located on Bushrod Island near Monrovia, the capital, did not appear to be ready for the number of patients that quickly flooded its doors. Some lay motionless on the floors of the ambulances outside the center, too weak to get out. They had traveled for hours after being turned away from other hospitals in the area. No one from inside the hospital arrived to offer assistance. “Try to come down and walk a little,” a worker told him. “I’m too tired,” the man said. But he summoned his strength and got out of the ambulance — and immediately collapsed on the ground. A little boy tried to walk out of another ambulance, but he too collapsed. The two lay on the rocky ground just a few feet apart. The boy was completely naked and the man was naked from the waist down — Ebola patients often don’t wear pants because of the intense diarrhea caused by the virus. “Let him rest,” another worker said, and they agreed to let him stay where he lay. When asked why no one from the hospital was helping them get inside, a hospital worker said staff was inside suiting up in protective gear. Ebola spreads through contact with bodily fluids from an infected patient. More than 2,800 people have died over the past six months in West Africa. Five countries have reported Ebola cases, but Liberia, Guinea and Sierra Leone have carried the largest burden. Island Clinic is supported by the government of Liberia and the World Health Organization. When shown CNN’s video of the patients collapsing, a WHO representative was horrified, but said the patients shouldn’t have waited until they were so sick to seek help. “I think the lesson here is that people come too late,” said Peter Graaff. But many Ebola patients don’t wait by choice — there’s an estimated shortage of 700 Ebola beds in Monrovia alone, and patients often wander from hospital to hospital, only to be turned away. Graaff said he would try to find out why hospital workers didn’t come help the patients. He said he hopes any opening-day difficulties won’t discourage patients from seeking help — he doesn’t want them to stay home. John Bonifield, Orlind Cooper, Orlando Ruiz and Jacque Wilson contributed to this story. Lives have been lost, and families have had to undergo the trauma of isolation. The fear of the unknown even very crippling. We read about the numbers in the news, but when we put a face to the news reports, it brings it home. Dr. Ada Igonoh of First Consultants Hospital is one of the doctors who attended to Patrick Sawyer. She was infected by the virus and miraculously, she survives to share her story with BellaNaija. It is a long read but definitely worth reading as Dr. Ada details her experience. It’s a really gripping read which shows the story of strength, faith and dedication. We are grateful to Ada for sharing her story with us. On the night of Sunday July 20, 2014, Patrick Sawyer was wheeled into the Emergency Room at First Consultants Medical Centre, Obalende, Lagos, with complaints of fever and body weakness. The male doctor on call admitted him as a case of malaria and took a full history. Knowing that Mr Sawyer had recently arrived from Liberia, the doctor asked if he had been in contact with an Ebola patient in the last couple of weeks, and Mr. Sawyer denied any such contact. He also denied attending any funeral ceremony recently. Blood samples were taken for full blood count, malaria parasites, liver function test and other baseline investigations. He was admitted into a private room and started on antimalarial drugs and analgesics. That night, the full blood count result came back as normal and not indicative of infection. MONROVIA, Liberia – The United States and Britain will send medical equipment and military personnel to help contain West Africa’s Ebola outbreak, as the World Health Organization warned Monday that many thousands of new infections are expected in Liberia in the coming weeks. The current Ebola outbreak is the largest on record. It has spread from Guinea to Sierra Leone, Liberia, Nigeria and Senegal and killed more than 2,000 people. An “exponential increase” in new cases is expected in the hardest-hit countries in coming weeks, the U.N. health agency warned. Military personnel will set up a 25-bed field hospital in the Liberian capital, Col. Steven Warren, a Pentagon spokesman, said Monday. The clinic will be used to treat health care workers, a high number of whom have become infected in this outbreak. Once set up, the centre will be turned over to the Liberian government. There is no plan to staff it with U.S. military personnel, Warren said. “This is not Liberia’s particular fight; it is a fight that the international community must engage very, very seriously and bring all possible resources to bear,” said Information Minister Lewis Brown. 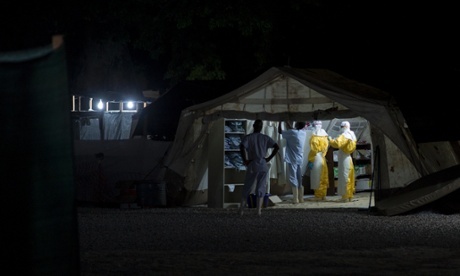 In addition, Britain will open a 62-bed treatment centre in Sierra Leone in the coming weeks. It will be operated by military engineers and medical staff with help from the charity Save the Children, Britain’s Department for International Development said Monday. The clinic will also include a special section for treating health care workers, offering them high-quality, specialist care, the statement said. Currently, there are about 570 beds in Ebola treatment centres in Guinea, Sierra Leone and Liberia, the hardest-hit countries, and the World Health Organization says nearly 1,000 more are needed, the vast majority of those in Liberia. And experts say it’s not just beds, but that more international and local health workers that are needed. Doctors Without Borders also urged Washington to not simply set up clinics but also to staff them. Many health workers, however, have been reluctant to respond to the crisis out of concern that there isn’t enough protective equipment to keep them safe. A fourth American who contracted Ebola in West Africa was expected to arrive in the U.S. for care Tuesday, Emory University Hospital — where two other aid workers successfully recovered from the disease — said Monday in a news release. Ebola is spread through the bodily fluids of people who show symptoms, and doctors and nurses are at high risk of infection because they work closely with the sick. The WHO doctor whose infection was announced Monday is the second health care worker with the agency to catch Ebola. The doctor is in stable condition and will shortly be evacuated, the agency said. In Liberia alone, 152 health care workers have been infected with Ebola and 79 have died, WHO said, noting that country had too few doctors and nurses even before the crisis. “Every infection or death of a doctor or nurse depletes response capacity significantly,” it said. U.N. Secretary-General Ban Ki-moon called several world leaders over the weekend, including the British prime minister and French president, to urge them to send more medical teams and money to fight the outbreak. Officials have said flight bans and border closures — meant to stop the disease’s spread — are slowing the flow of aid and protective gear for doctors and nurses to the region. At an emergency African Union meeting Monday, members agreed to open borders that have been closed and lift bans on flights to and from affected countries, according to Nkosazana Dlamini Zuma, chair of the AU’s Commission. But it was unclear how quickly those promises would be kept. Earlier, Senegal, which has shut its borders and blocked flights, said it was planning to open a “humanitarian corridor” to the affected countries. The Ministry of Internal Affairs through its Bureau of Customs and Culture and in collaboration with the National Council of Chiefs and Elders has announced the immediate suspension of all Poro and Sande activities throughout Liberia. Sande, also known as zadεgi, bundu, bundo and bondo, is a women’s association found in Liberia, Sierra Leone andGuinea that initiates girls into adulthood, confers fertility, instills notions of morality and proper sexual comportment, and maintains an interest in the well-being of its members throughout their lives. In addition, Sande champions women’s social and political interests and promotes their solidarity vis-a-vis the Poro, a complementary institution for men. The Sande society masquerade is a rare and perhaps unique African example of a wooden face mask controlled exclusively by women – a feature that highlights the extraordinary social position of women in this geographical region. The ministry says its attention has been drawn to reports of the continued operation of Poro and Sande societies in several parts of the country in violation of the moratorium placed on the operation of Poro and Sande Societies on June 2, 2014. In a press release issued here, it said the decision then, and now, was intended to ensure that there is no outbreak of the Ebola virus in any Poro or Sande grove in Liberia.“This would be a disaster and it must be prevented in the interest of saving additional lives of our fellow citizens”, the release read. However, the ministry notes that in spite of its demonstration of understanding and accommodation, some individuals have continued to operate Poro and Sande Groves and conduct cultural festivals. According to the press release signed by Minister Morris Dukuly, such practices in the face of the Ebola epidemic exposes citizens to increased incidents of the virus and untimely death. The ministry therefore directs that all such practices must cease and be seen to have ceased by September 17, 2014. MIA warns that any grove which operates or reopens its doors to initiate persons will be seen to be in defiance of its General Circular No. 13 and its most recent statement, reaffirming the provisions of the General Circular. The Ministry says, the two-week extension it is granted under this statement is to allow the smooth closure of all Poro and Sande Societies operating in the country, and should not be viewed as an extension of the term of existing graves. It said any grove or society found operating beyond the September 17, 2014, date would be ordered immediately closed in keeping with cultural, traditional practices, and its guidelines and regulations, while persons operating such groves will be prosecuted under the laws of Liberia. Meanwhile, the Minister of Internal Affairs is authorizing all county Superintendents, District Commissioners, County Inspectors, and other appropriate local government officers ensure full compliance with this directive, and to close uncooperative Sande and Poro Societies upon the expiration of the two-week extension period. The release said the Minister of Internal Affairs has written to inform Chief Zanzan Karwor, Chairman of the National Council of Chiefs and Elders, of the directive, and requested the full cooperation of the council. Monrovia – The deadly Ebola virus is spreading in Monrovia and beyond, touching the security sector as 18 Police officers have been quarantined in Bloc C at the Police Barracks in Monrovia. According to sources, one Police officer serving the Police Support Unit (PSU) contracted the virus and is currently undergoing treatment at the ELWA Ebola center. One senior Police source confirmed to FrontPageAfrica that the officer is in critical condition at the Ebola treatment center. The Police officer is said to have contracted the virus from his wife who is a nurse, who transferred the virus to her husband after also getting infested from work. The health of the PSU officer prompted the quarantining of Bloc C of the Police barracks where accordingly the 18 Police officers are residing. Located at the intersection of Camp Johnson Road and Capitol By-pass the Police Barracks is home to several Police officers and their dependents. According to one member of the Ebola Task Force, several items have been supplied the quarantined Police officers including chlorine, biscuits and other materials. Police officers are used in protecting clinics and other medical facilities also accompanying various medical teams, including burial, collection of sick patients and others. The officers are usually not seen wearing protective gears including gloves and other PPEs while providing protection in medical facilities and carrying out other duties closely related to Ebola. Police officers are also used to implement quarantine in several communities as they were recently deployed to ensure the quarantine of the West Point community and some are now in Dolo’s Town, Margibi County performing similar duty. 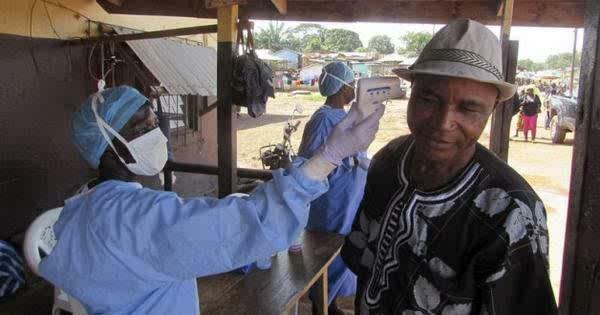 United States based Centers for Disease Control has warned that up to 20,000 people will get infested with the virus before it is brought under control, but it seems the Liberian government does not agree with such prediction as President Ellen Johnson Sirleaf has publicly declared disagreement with the CDC’s prediction. Despite disbursement of funding from the Ebola fund to the security sector including the Police, Police officers are not adequately catered for as some officers have complained that they do not receive daily per diems and other protective materials, thus making vulnerable to contracting the virus.